Managing your waste is a priority, we offer a full disposal service of waste including electrical and white items (WEEE) through to disgarded furniture or daily office waste including any confidential items, we can assist you with any relevant documentation and certification that makes our clients compliant.We offer a scope of services to our clients which range from regular, scheduled collection of your waste, to ‘keeping it green’ with our recycling service. We also provide a ‘one-off’ service which is our reactive response to understanding that sometimes, some days are more ‘wasted’ than others: meaning that if your bins are overfilling before your weekly timeslot, we can arrange an emergency disposal. 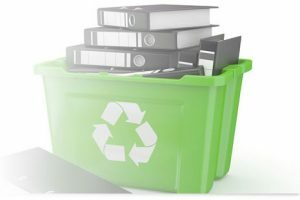 We understand that your business should remain only your business; our confidential, shredding service which is all fully licensed (courtesy of the Environment Agency) ensures that our clients can be confident in the removal of paperwork.With us, your waste will be managed in a manner of utter professionalism. We have proven, over our 30 years of experience, to be a safe and reliable company with a proactive, hassle-free approach. We leave your area workable and conductive.